When it comes to style inspiration for over-60s, it’s hard to go past Jane Fonda. The 81-year-old actress pulled out another show-stopping look on Saturday, this time donning a fitted all-black ensemble, which showed off her fabulous slim figure, as she attended The Hollywood Foreign Press Association (HFPA) Film Restoration Summit in California. 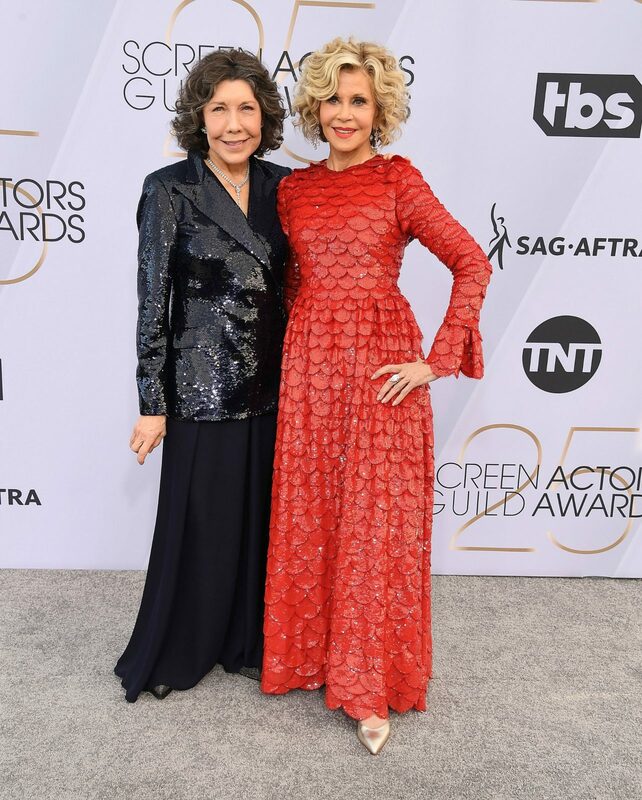 The Grace and Frankie actress looked glamorous in the ensemble which included a stylish pair of wide-leg pants and long-sleeved top. Jane teamed the show-stopping look with a pair of pointy black boots and a matching chunky necklace. Jane looked every inch the star as she posed for photos at the event, her beautiful features highlighted with a soft pink lip, swipe of blush and lashings of dark mascara. Meanwhile, the actress chose to wear her blonde locks down in her usual style, with soft waves framing her face. Meanwhile, Jane proved she is every bit a fashion icon as she showed off yet another stylish outfit for an event in Los Angeles earlier this year. Attending the SAG Awards, the actress kept her style elegant, opting for a red sequinned Valentino gown with bell sleeves, as she hit the red carpet alongside her co-star Lily Tomlin. While Jane’s eye-catching gown certainly made a statement, it was her jewellery that really stood out. The actress sported an enormous sparkly diamond ring which, according to Page Six, is worth $3 million. The teardrop-shaped jewel by Italian brand Gismondi weighs in at 20 carats. Meanwhile, Lily looked equally stylish in a long floor-length skirt paired with a black sequinned blazer. The 79-year-old actress teamed her outfit with a pair of black pointed heels and accessorised with simple silver jewellery. Their glamorous appearance comes after the pair stopped by The Ellen DeGeneres Show in January to play a hilarious game. It’s been joked that the theme of this year’s Grace and Frankie is “f*** it” and Ellen decided to play a game called “Lily and Jane don’t give a f***” to promote the new season, which was released on Netflix just over a month ago. The host was forced to apologise for swearing on-air, but insisted it was simply the theme of her guest’s show. Are you a fan of Jane Fonda? Do you like her style?